Security updates are a common occurrenceonce you have installed Drupal. In October 2014, there was a massive defacement attack that effected Drupal users who did not upgrade in the first seven hoursafter a security update was released. This means that Drupal updates must bechecked as frequently as possible (even though by default, Drupal checks once aday). Issue #1: Whenever the Drupal update process fails,Drupal states that everything is up to date instead of giving a warning. The issue was due to some sortof network problem. Apparently, in Drupal 6 there was a warning message inplace, but this is not present in Drupal 7 or Drupal 8. Since there is a CSRF vulnerability in the "Check manually" functionality(Drupal 8 is the only one not affected), this could also be used as a server-siderequest forgery (SSRF) attack against drupal.org. Administrators mayunwillingly be forcing their servers to request unlimited amounts ofinformation from updates.drupal.org to consume network bandwidth. To exploit unencrypted updates,an attacker must be suitably positioned to eavesdrop on the victim's networktraffic. This scenario typically occurs when a client communicates with theserver over an insecure connection, such as public WiFi, or a corporate or homenetwork that is shared with a compromised computer. The update process downloads aplaintext version of an XML file athttp://updates.drupal.org/release-history/drupal/7.x and checks to see if it isthe latest version. This XML document can point to a backdoored version ofDrupal. Offering fake updates is asimple process. Once requests are being intercepted, a fake update response canbe constructed for any module. When administrators click on the “Download these updates” buttons, theywill start the update process. This is how it looks from anattacker’s perspective before and after upgrading the "Additional Help Hint” module. First itchecks for the latest version, and then it downloads the latest (malicious)version available. Issue #3: Drupal security updates are transferred unencryptedwithout checking the authenticity, which could lead to code execution anddatabase access. You may have heard about such things in the past. KurtSeifried from Linux Magazine wrote an article entitled "Insecure updatesare the rule, not the exception" that mentioned that Drupal (among others)were not checking the authenticity of the software being downloaded. 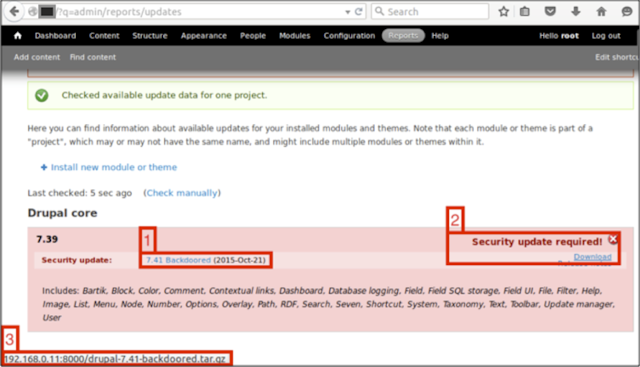 Moreover, Drupalitself has had an open discussion about this issue since April 2012 (https://www.drupal.org/node/1538118).This discussion was reopened after I reported the previous vulnerabilities tothe Drupal Security Team on the 11th of November 2015. You probably want to manually download updates for Drupaland their add-ons. At the moment of publishing there are no fixes available. TL;DR - It is possible to achieve code executionand obtain the database credentials when performing a man-in-the-middle attack againstthe Drupal update process. All Drupal versions are affected.